THE PENTAGON — Forward-deployed Marines are using a new system to protect U.S. troops from the threat of cheap and lethal unmanned aerial vehicles, the service told USNI News last week. The Marine Corps’ Ground-Based Air Defense (GBAD) Counter-UAS system was developed over the last two years to detect, identify, track and defeat small unmanned aircraft are that are putting forward forces at risk, said Lt. Col. David Sousa, who works in the office of the deputy commandant for combat development and integration. “A couple of years ago the Marine Corps started heavily pursuing a counter-UAS capability. We’ve utilized drones on the offensive [information, surveillance and reconnaissance] capabilities for decades now, but we didn’t look at the counter side of this until the threat started to evolve,” Sousa said. 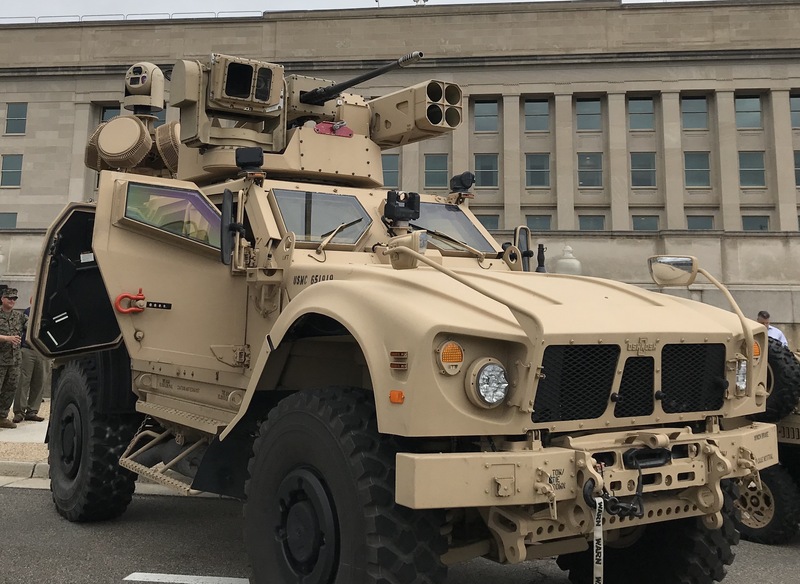 GBAD combines systems like the existing RADA RPS-42 S-band radar, the Sierra Nevada Modi electronic warfare system, Lockheed Martin visual sensors and the Raytheon Coyote anti-drone UAV to allow air defense Marines to detect, track and destroy hostile drones. The Marines took the systems and sought integration help from Naval Surface Warfare Centers Crane and Dahlgren, Maj. Ho Lee with Program Executive Office Land Systems told USNI News. “We’ve been trying to use existing systems inside the Marine Corps, or ones we’re already working on and repurpose it for different missions,” he said. The GBAD is built to be expeditionary. The current prototype version is built to operate from a forward operating base, a Marine M-ATV or a pair of the Marines’ new MRZR off-road vehicles. 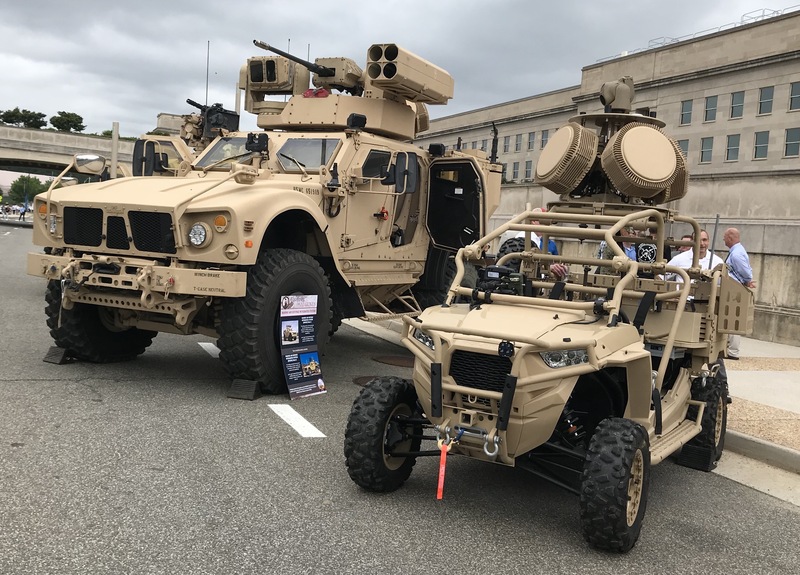 Last week, the Marines showed off the variety of configurations for the GBAD system in a Pentagon parking lot. The systems are now headed to additional testing and a planned deployment with a forward unit to counter the ongoing threat of lethal drones. The service has developed an undisclosed number of systems that are deployed now to answer an ongoing urgent joint operational needs to protect forces from an armed drone threat and is placing the system in the hands of Marines down range as the service further develops the concept. 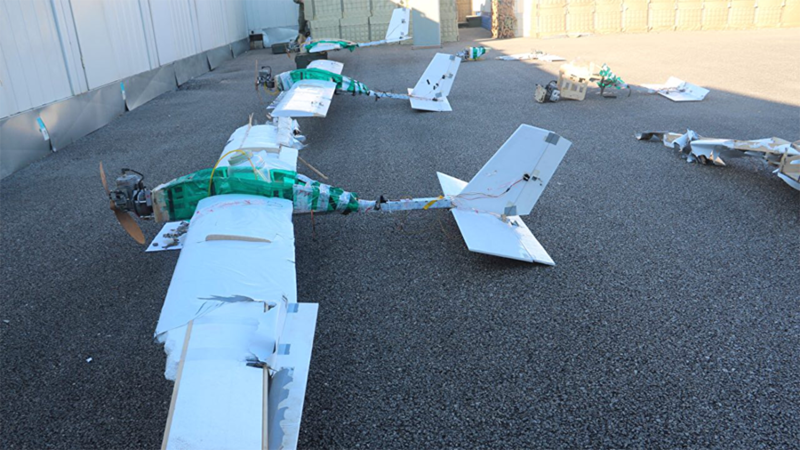 Lee and Sousa would not disclose where the systems have been deployed, but the Islamic State’s use of armed DIY drones have plagued military units in Syria and Iraq. The U.S. has at least three forward operating bases in Syria, according to a Congressional Research Service report. In January, the Islamic State sent more than a dozen armed fixed-wing UAVs to attack Russian airfields in Syria. Other reports indicate there have been hundreds of other drone attacks carried out in the region. While systems are being tested and deployed, the Marines are set for GBAD to become its own program office and move from a research and development program into a new funding line for the Marine Corps. “We want to take advantage and leverage all of the stuff we’re doing and transition this into a program of record,” Lee said.